As one of the oldest power tool companies in the industry, Porter Cable has provided high, industrial quality power tools since 1906. 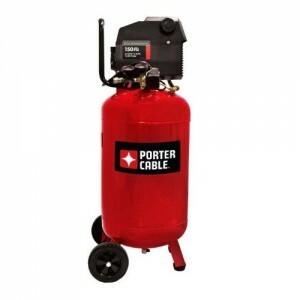 The company has produced hundreds of tools, including the 20-gallon PXCMF220VW 20-gallon portable air compressor. This air compressor offers some impressive features such as an oil-less design, and includes accessories such as 7-inch semi-pneumatic wheels and rubber feet. In addition, the unit is CSA certified and the tank is ASME certified. Take a closer look at the many features that the Porter Cable PXCMF220VW has to offer. The compact design of the PXCMF220VW compressor unit weighs in at under 100-lbs. Comparablylightweight, the unit includes wheels attached at the base, to allow users to move the unit with ease, and two rubber feet to allow the unit to stand upright with impressive stabilization. ASME and CSA certified this 20-gallon air compressor’s horsepower peaks at about 1.5 HP. It offers 4.0 CFM at 90 PSI, and 5.0 CFM at 40 PSI. It only requires 15 amps of power. The oil-free design allows users to get the job done on any terrain without having to change the oil, refill the oil, or worry about uneven ground. The PXCMF220VW model is oil-free;therefore, there are no pumps. Oil-free air compressors offer many benefits to users. If you are looking for a unit that you can use without worrying about whether or not it is on an even terrain, then this model is for you! Testing at 84 dB for noise level, the unit is not exactly quiet. While many users complain about the noise, the use of ear protection while using tools such as this should be common practice anyway. 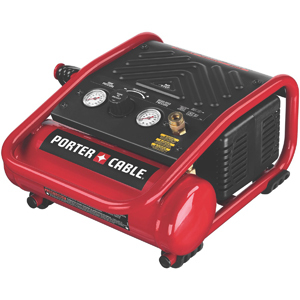 Designed for the travelling professional, such as sub-contractors, the Porter Cable PXCMF220VW 20-gallon portable air compressor can easily be used by anyone. It works well for many project jobs, such as painting a vehicle, as well as a variety of household projects. 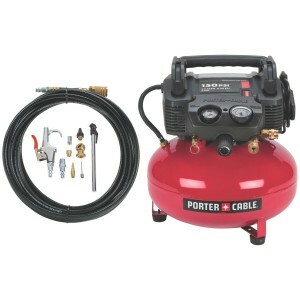 The Porter Cable PXCMF220VW 20-gallon portable air compressor is great for just about anyone – if you can overlook the noise level. 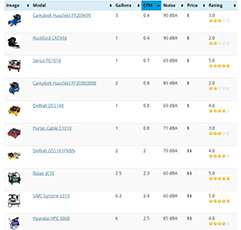 It offers a wide variety of useful features for residential and commercial users alike. However, if you need a quiet unit, then you should consider looking somewhere else. The price on this unit averages around $250 to $350, so it is a little expensive, but considering all of the features and benefits that it has to offer, that price is justified.